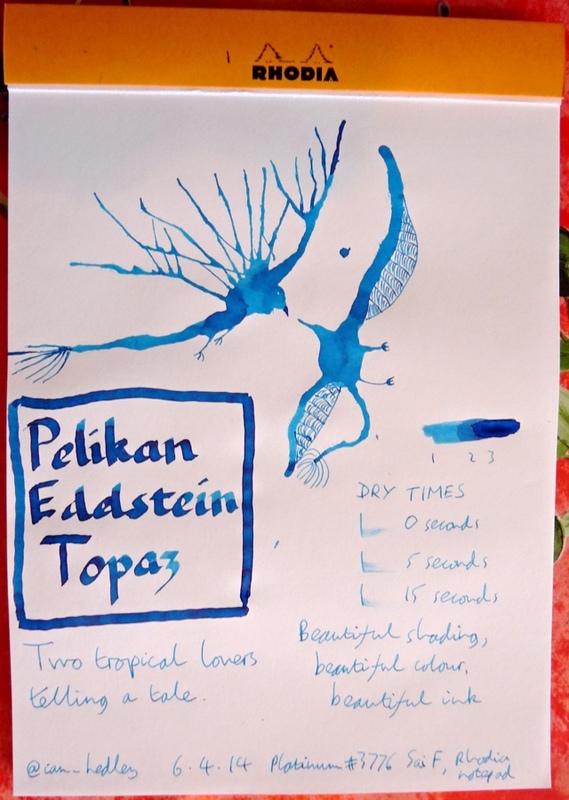 Pelikan Edelstein Topaz ink review – Pens! Paper! Pencils! This is a beautiful blue ink. It has wonderful shading and dries quickly. This and Kiri-Same are the only inks I always have in use (at the moment). 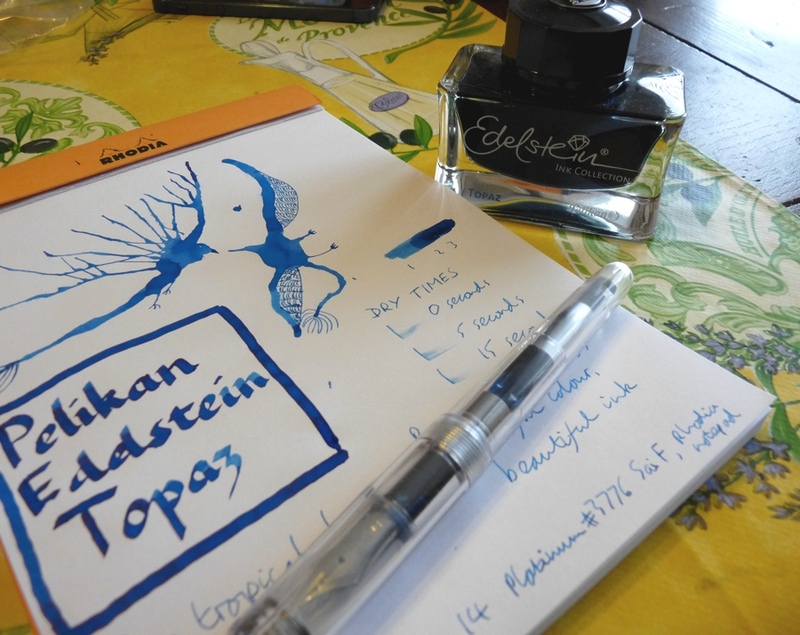 Ian- can you tell me why this beautiful blue ink is “Named” Topaz? In my world the color topaz is a wonderful brown amber color. Ink companies do seem to come up with a lot of strange names. You’re right Topaz is usually a brown or amber but I did a Google imagine search and it does seem to come in blue variations too. Beautiful rendering with a wonderful ink. I love the ink’s color, shading and its occasional dark-red sheen. Thanks for posting it Ian. Beautiful color ink. I am not a HUGE fan for blues but this is a nice darker shade. Thanks for the review! Thanks, yes it’s a step above your average blue. Lovely inklings, and really fun to see you make them at speed! It is a beautiful blue. And your “tropical lovers” inkling is fabulous! – It seems planned rather than the serendipity I have watched you create on your YouTube channel. Thanks! I love this ink. Funnily enough it wasn’t at all planned until the first ink splodge came out exactly like a bird and the idea popped into my head. There must have been something in the air what with my getting married! Great review, I love this ink. One of my absolute favourites, is great to slow down some of the wetter nibs. Is that a Custom 74 with it? Hi Ruth and thanks. It’s a Platinum #3776 Sai. A beautiful pen for a beautiful ink.